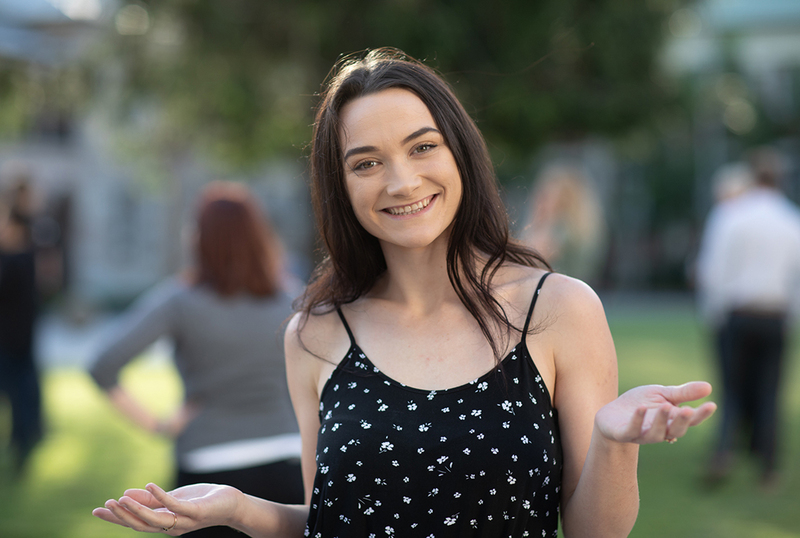 For Honours student Hayley Fox, a Tim Fairfax AC Learning Potential Fund scholarship was the lifeline she needed to pursue her dream of moving to Brisbane to study law. “I grew up in Wallaville – a town about fifty kilometres from Bundaberg – and lived with my mum, dad and four of my five older brothers. We were happy children and had no idea we came from a low socio-economic family,” she said. As she got older, Hayley watched as her parents struggled to keep up with finances. Her brothers dropped out of school and she eventually considered doing the same. But she soon changed her mind when, in 2012, her world was turned upside down. “A very close family member, Nick, had an accident on the farm where he worked. Because of the accident, he lapsed into an extended coma." At the time, Hayley’s family were given the option of turning off his life support; however, struggling with grief and unable to afford legal advice, they had no idea what the ramifications would be. Fortunately, Nick eventually woke up. Since the accident, he's had to relearn to walk and only recently relearnt basic motor skills. This drove Hayley to apply for the Bachelor of Laws (Honours) program at QUT and with an OP 3, she was guaranteed a place. However the financial barrier of moving to Brisbane almost cut short her plans. The Tim Fairfax AC Learning Potential Fund scholarships are a lifeline for many students, offered in perpetuity through the QUT Learning Potential Fund. The scholarships are for low-income students, just like Hayley, who dream of going to university but don’t have the means to make it happen. Hayley’s scholarship allowed her to move to Brisbane, pay her rental bond, and purchase textbooks and a laptop for her first semester at university. She’s now completing the final year of her Bachelor of Laws (Honours) and pursuing her passion for family law. “I hope to one day practice in family law and be a successful solicitor who works for the greater good. I’m currently working as a paralegal and gaining skills which will hopefully help me to achieve this dream. “Coming from a rural and isolated area, I have always been an advocate for self-improvement and am a big believer in making the most of every opportunity. “Without the Learning Potential Fund, I would not have been able to come to university and work toward my dream of helping families, just like mine, who find themselves in vulnerable situations. This year, 2018, marks the 20th Anniversary of the Learning Potential Fund (LPF), which gives students from all backgrounds the opportunity to pursue a university education. With your support, the Learning Potential Fund has provided more than 19,000 students financial assistance, and helps finance a portfolio of more than 2,000 annual scholarships. By supporting the fund, you’re helping to change the lives of QUT students in need; helping them create real futures for themselves. In turn, many of these graduates are giving back to the community and the next generation of students. Find out more about the QUT Learning Potential Fund today.